The best prawn curry I have ever eaten has to be the one my maternal grandmother used to make when we were kids This was in the good old days when the fisher woman used to come to the door of my grandmother’s apartment in Bombay and sell fresh produce. This being the not so good old days and me being more queasy than my grandma, I get my prawns washed, de-tailed and cooked from Waitrose. 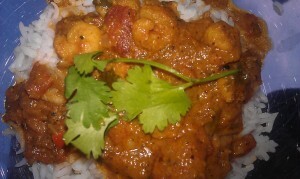 A bit of a cop-out I know – but what the hell, the prawn curry I make tastes pretty good. Well, at least the son loves it and so my job is done. Don't cook for too long after you put the coconut milk in as it can split. Heat the oil in a pan and add in the chillies and the onions. Now add in the prawns and fry for a bit. Add in the tomato, garam masla, chilli powder, turmeric and salt and mix thoroughly. After a couple of minutes add in the coconut milk and cook gently on simmer for a few minutes. Garnish with coriander and serve on a bed of rice. 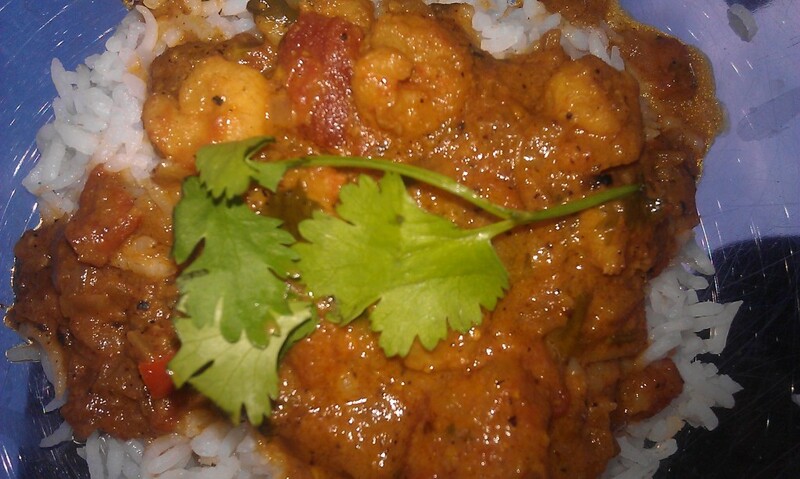 This entry was posted in Recipes from our kitchen and tagged indian recipe, Indian recipes, prawn, prawn curry, recipe, recipes, waitrose prawns by Poornima. Bookmark the permalink.